As a lifetime fairy-tale lover, I must confess to also being something of a Disney addict. That being said, of all the classic Disney fairy-tale princesses, Cinderella has always been my least favorite. Sure, all the female heroines were a bit cookie-cutter in those early days, but the others seemed to have something about them to make them stand out. Snow White was the original cheer-bringer that Walt pulled out of the bag. In Sleeping Beauty, Aurora’s haunting voice and stylistic animation made her seem elegant and mysterious. In the 1990s and 2000s, Disney princesses got more exciting. At first they branched out the princess characters with Belle, Jasmine and Ariel, who managed to still be princess-y while also instilling independence, a little rebellion and “girl power” to a rising generation. The new millennium princesses, perhaps beginning with Mulan and being followed by others like Tiana, Merida, Elsa, Anna (ect) introduced an even more three-dimensional portrait of a heroine to young audiences. These new princesses were more like real girls, ones you would want to be BFFs with: sweet, spazzy and flawed enough to be relatable. Cinderella just kind of disappears in the crowd of these newer, more exciting leading ladies. The newest princesses, overall, seem like a combination of “manic pixie dream girl” and “warrior princess.” If you don’t know, “manic pixie dream girl” is a term used to describe the spontaneous,childlike, delightfully idiosyncratic girl that pops up to instill light-heartedness in many a popular RomCom today. Warrior princesses have been around a long time, but now many of our favorite, more traditionally dainty princess characters are getting a swords and archery equipment. Consider the warrior adaptations that have been made to the Snow White character, for instance, in ABCs show Once Upon a Time or in the films Mirror Mirror or Snow White and the Huntsman (Admittedly, not really for kids. And seriously? Kristen Stuart couldn’t lift that sword). First off, let me say that I don’t think there’s anything wrong with manic-pixie dream girls or warrior princesses. If I was a princess, I’d want to be a warrior princess. Sometimes I am, or like to think I am, a manic pixie dream girl. In some ways, this “new take” on princesses offers some important things to young audiences: it’s really important for children to be able to like and identify with realistic protagonists who overcome obstacles. The childlike quality of these new characters is very engaging for their target audience, while the warrior princess route is also a very clear and easy way to show young girls that they, too, can be “strong” and that this trait is just as admirable in girls as it is in boys. However, looking at the classic fairy-tales, I also have to feel that we are missing something important in these new characters. The heroines of ye olde fairy tales are good, beautiful, and pure in a way that is not necessarily relatable, but certainly admirable. The point of their existence is to inspire. They go through difficult things and come out on top at the end of everything because of their enduring goodness. It’s a different kind of strength, really, one that adults tend to know about but today’s kids seem to really struggle with. Our new brand of quirky, action-hero princesses seem to have lost a little bit of that original fairy-tale magic. Enter Cinderella, Disney’s 2015 live remake. It’s a beautiful film in all ways aesthetic: a true fairy-tale come to life. And, essentially, it’s not too different in basic structure than Disney’s animated version. However, despite my apathy towards the cartoon, this movie completely stole my heart, and that has everything to do with the way that the filmmakers developed these classic characters. 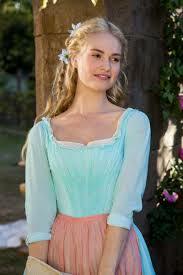 In the film, Cinderella doesn’t get a sword, or any major character flaws that we can see. She is, essentially, a classic fairy-tale princess in that she is written as an aspiration more than a reality. However, screenwriter Chris Weitz, director Kenneth Branagh and actress Lily James managed to take this simple, pure character and bring her to life as someone that an audience could find both loveable and strong. While this mantra fuels Cinderella’s determination to keep trying, we do see her emotional struggle as she starts to believe the words of her step-sisters or has moments of frustration. The realness of these emotions makes it easier for an audience to connect with her, and we also can be more impressed by how she copes with her own sorrow and manages to find happiness within her circumstances. In the South, where I live, we would call this being a “Steel Magnolia.” It’s a type of strength that looks pretty and graceful on the outside, but is made of some seriously tough stuff underneath. It seems to me that this kind of strength is often forgotten in the creation of little-girl heroines today. The character of the prince is also well-developed in this story (played by Richard Madden). Again, in the animated Cinderella, the audience doesn’t have much opportunity to connect with him or know much about him. He is almost just a means for Cinderella to escape her awful life. In the newer version, the Prince and Cinderella have the chance to meet before the ball, and the audience is given a good dose of their chemistry as well as the opportunity to see Prince’s relationship to his own family. We also see his own struggle between his feelings for Cinderella and his desire to honor his father’s wishes for the good of the kingdom. This is the type of situation that might tend to paint the king as a villain in many modern interpretations, but in this film the audience can see that father and son have a loving relationship. Again, both Cinderella and the Prince’s respect for their parents is heavily conveyed. This also seems to be a rare find in Disney films (and a valuable one, at that). As someone who is about to become a parent, and who can recall being the five year old who tried on a little rebellion “because Ariel did,” I don’t think that protagonist characters who model respect for their parents can be highly praised enough. Ultimately, the audience gets the same feeling about the prince as we do for Cinderella. They are both incredibly sweet and heroic characters, and we’re happy when they end up together. 7 Things to See in London on a Budget!